You know how you meet a queen for the first time and instantly fall for them – their artistry, performance, aesthetic and of course their personality? That’s exactly what happened to our Sparkles when she got to meet Aja at this year’s Heels of Hell tour in the UK and she hasn’t shut up about them (or stopped listening to the latest single release Art Jesus) ever since. Since we know that a lot of our readers share her feelings, we’ve decided it’s time to put our emotions into action and compiled this handy list of Five Reasons Why we love Aja (and you should too!). Reason 1: Breaking out of all the boxes. [B]eing a queer artist is more generalized, and being a drag queen is way more specific. I know I kind of let go of the idea of being a drag queen because, for most people, the stereotypical drag queen lip syncs and performs. I’ve been working on my burlesque and my live music, and I don’t really have the drive to dance and flip flop and be doing dips and, ‘Is she gonna jump from there?’ It’s just not something I want to do. It’s something that is part of me, but it’s not something that I’m carrying into the future, so I’m kind of leaving the term behind. And we can’t wait to see where Aja will go in the future, because there is no doubt that this one will make it far – and we’re here all the way (and hope after reading this, you will be too!). Right, let’s jump right into the second reason why we think you should consider Aja the unicorn in a herd of horses – and no, we’re not talking about their bubblegum pastel pink kawaii aesthetic in I’m Kawaii (yet! ), but rather we want to point out the fact that they use their platform to actually speak up about the important things in life and society and constantly try to uplift their fellow humans. It’s refreshing to read Aja’s threads on Twitter, where they put out their thoughts in a well-expressed and educational manner and stand up for their beliefs. I discovered Aja through RuPaul’s Drag Race Season 9 and followed them from there. I had always been a big fan but I fell in love with them on All Stars 3. Since then I have been following them on tour, listening to their music, buying merch and everything else! I love Aja because they are one of the most genuine people I’ve ever met. They are so kind and humble. They use their platform to speak about important topics whereas others don’t. They speak for so many people whilst standing up for themselves aswell. They are such an amazing person to look up to; they have given me so much confidence within myself and I wouldn’t be the person I am today without them. It’s hard to pick a favourite song because I love them all but if I had to it would be Finish Her. That song made me fall in love with Aja’s music and I’ll probably never not feel great listening to it. The lyrics are amazing and truly give me so much confidence and remind me not to care what other people think. I always have fun seeing them perform it! I am most excited for Aja’s upcoming album. I love their music so much so I’m really excited to hear new stuff from them. I can’t wait for them to tour again and see where they go next. Aja is a queer artist who deserves to be recognised all over the world so I hope huge things happen for them after the album! My favourite Aja moment is when I followed them on their recent run of UK shows. I went to Cardiff, Newcastle, Belfast and Glasgow. My go to makeup look is orange eyeshadow and everytime I saw them on these shows I would be wearing it and it would be a running joke if I had changed it or not yet. Now that the shows are done, the joke has continued onto Twitter and Instagram and it’s so so funny. Those shows were some of the best times of my life! Let’s talk what happened after the M&G at Heels of Hell – if you ever had the chance to see Aja perform live, you know why we’re making their stage-slaying abilites the next point in our list. 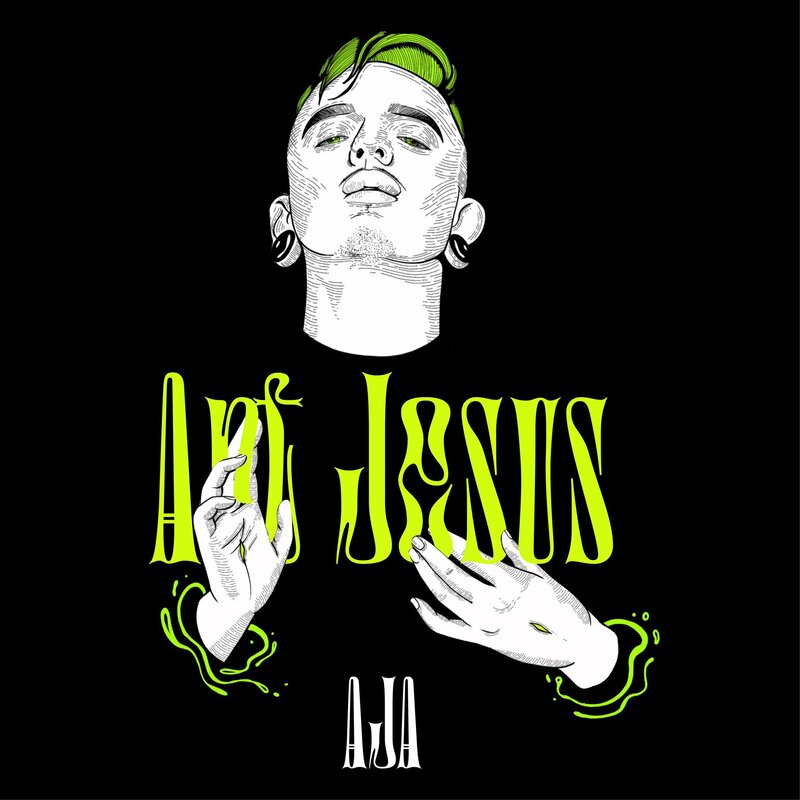 Even if you’re not into rap, believe us, after listening to Art God and Art Jesus, you will never want to listen to all these songs that are out there and have a chorus consisting of corny, contentless one-liners again. Contrary to a huge part of the ‘mainstream’ music out there, Ajaqueen’s lyrics are so intelligent and layered, we honestly think they should be considered poetry and we’re pretty sure they could easily make the list to be analyzed in an A level literary course, because all the references – let us tell you! There is biochem, pop culture, art icons … and – of course, the slaying chorus line that makes you sing (ok, scream) along to ‘I’ve never been the sorry type’ at 6.30 am in the morning as you’re driving to work (lyrics featured in latest single Art Jesus). If you want to know more about Aja’s music, check out our contributor Soph’s article on it here, but first, go listen to all of their songs on Itunes or SpotifySpotify. Also we are very excited about the prospect of a new album coming out soon – Aja have been hinting about ‘Box Office’ containing 18 tracks and coming out early next year, and we can’t wait to listen to it on repeat once it’s out! Ok, we’ve talked being a supportive human being, slaying the stages around the world, creating musical masterpieces – it’s time to get into the aesthetical side of all things Aja. If you visit their website ajakween.com (or just go visit their instagram), you will be amazed by a set of photos showcasing a plethra of different looks from pastel pink kawaii goodess to fierce black warrior princess – Aja looks breathtaking in all of them and we’re pretty sure, they’ll never fail to amaze us with their creative and thoughtful outfits – just like they did during the whole Heels of Hell tour: sea witch (giving us Brazilian sea goddess Jemanjá-vibes), the iconic sad clown look (that has been immortalized by one of our favorite artists Stacey Fox), the scary (but very adorable) pumpkin, or the fierce p*ssy look – you name it, Aja have probably done it! What we love about their style is that they don’t conform to the standards that society (even ‘drag’ society – so to speak) tries to put on people and will instead just march to the beat of their own heart and soul, and if that means taking their wig off at the end of a set and being fabulously fierce no matter what – we are here for it! This brings us just around to the first point on the list – talk about a full-circle moment: Aja really are just themselves and will not back down for anyone and this is a quality everyone of us should be striving for because society needs people with a backbone instead of their tail between their legs to make this world a sparklier, nicer, better, and most of all more supportive place. And these are the five reasons why we (and a whole lot of people from around the world) love Aja very much and will continue to support them as we all continue our journey on this earth. Please feel free to message us your comments and opinions on this article, but refrain from hating just for hatefulness’ sake – we’re trying to spread the love and while we wait for you all to read this, we are going to listen to Art Jesus some more. Next Victoria’s Secret in hot water over lack of inclusivity.